The members of our staff are national experts on the right to counsel, not only in helping states and counties understand the minimum requirements of the Constitution, but also in guiding policymakers in crafting sustainable solutions that promote public safety and fiscal responsibility. At the Sixth Amendment Center, we believe in using the most effective means – most efficient, cost-effective, time-effective means that will yield a workable solution – to address the particular issue faced by the particular jurisdiction that seeks our help. Just as there is no one-size-fits-all model that states and counties must use to deliver effective defense services, so too there is no single method or approach that is the only way to help a jurisdiction, nor is there a rigid sequence of steps that must be followed. We are flexible, tailoring our assistance and support to meet each jurisdiction’s individualized needs, while the assistance we provide is at all times rooted in Sixth Amendment case law and the minimum national standards for right to counsel systems. Here is an overview of some of our work helping jurisdictions fulfill their constitutional obligation to provide effective assistance of counsel, listed alphabetically by state. Read about the Sixth Amendment Center’s work in a particular state by clicking on the name of that state. Or [Expand All] to see and print from one location our work in states throughout the country, then [Collapse All] to get back to the list of states. The Office of the Public Defender for the State of Delaware was established in 1964. However, a traditional public defender system cannot handle every single case that comes down the road on its own. For example, an attorney cannot ethically represent co-defendants whose interests may be at odds with one another. Historically, the Delaware courts oversaw the provision of counsel in conflict cases, using private attorneys to provide representation. When Delaware consolidated both primary and conflict services under its Office of the Public Defender, at their request 6AC Deputy Director Jon Mosher led a statewide assessment of conflict services to help them meet national standards of justice. 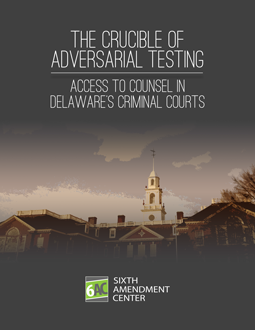 The report of 6AC’s findings and recommendations, The Crucible of Adversarial Testing: Access to Counsel in Delaware’s Criminal Courts, was released in February 2014. The work was funded through a grant from the United States Department of Justice, Office of Justice Programs, Bureau of Justice Assistance. The majority of reforms recommended by the 6AC report have been adopted. For example, 2015 legislation created the Office of Defense Services (ODS) composed of three branches: Central Administration, The Public Defender’s Office, and the Office of Conflicts Counsel. The Central Administration branch includes the management team, training and development, fiscal and human resources, intake and IT, and the branch handles all the non-case related business matters for the entire ODS. The Chief Defender is now appointed for an 8-year term. The primary public defender office now provides continuous representation by the same attorney in all felony cases in all counties. New funding has allowed ODS to increase assigned counsel rates to $90/hour. In 2013, Idaho was one of only seven states in the country that required their counties to carry the full financial burden of providing trial level representation (other than in capital cases) – a situation it has since remedied. That year, the Idaho legislature passed concurrent resolution HCR 026, acknowledging numerous systemic deficiencies in the delivery of the right to counsel and creating a legislative study commission to determine how best to move to state oversight of right to counsel services. The commission held its initial meeting in August 2013, where 6AC executive director David Carroll explained the state of indigent defense nationwide and Idaho’s systemic deficiencies specifically. At the request of the commission, the 6AC provided ongoing technical assistance as the commission continued its work toward the 2014 legislative session. 6AC’s assistance to Idaho was supported by a generous grant of the U.S. Department of Justice, Bureau of Justice Assistance. In 2014, Idaho created the independent Idaho State Public Defense Commission (ISPDC) to provide training, promulgate performance standards, and initiate uniform data collection, and importantly the Idaho legislature also prohibited all flat fee contracting. At the same time, the legislature appropriated $300,000 for the commission to begin their work, including hiring an executive director. The 6AC’s work did not stop there. With the Idaho legislature still unsure about how best to enforce the ISPDC standards, the legislative commission was reconvened and the 6AC was again retained to provide technical assistance. In 2016, Idaho took the next giant step forward in providing effective right to counsel services. 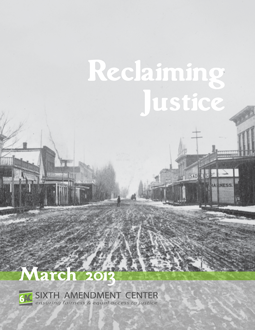 Legislation passed that year for the expressed legislative purpose of “improving the delivery of trial-level indigent defense services by providing funding to counties and creating standards with which counties must comply.” The ISPDC has authority to both promulgate and enforce standards that all of the courts in all Idaho counties must meet in providing representation to the indigent. All counties must comply with the ISPDC standards, with significant financial penalties for the failure to do so, but the state is providing funding to help them through general appropriations of $5.4 million. Read about the 2016 reform legislation here. The 6AC continues to work with the ISPDC as they draft standards and implement the legislative reforms. In 1989, Indiana began developing its current system for providing representation to indigent people who are facing the potential loss of liberty in felonies, misdemeanors, juvenile delinquency cases, and mental health commitments. That system — which has come to be known as “ the Indiana model” — allows for the state to reimburse counties for part of their expenses in providing representation to the poor in these cases, excluding misdemeanors (counties and cities must bear the full cost of providing misdemeanor representation), in exchange for complying with state standards. Counties can choose to seek reimbursement and comply with standards, or counties can choose to bear the full cost of providing indigent representation but not have to comply with standards. At the invitation of the Indiana Indigent Defense Study Advisory Group, composed of judges, legislators, prosecutors, defense attorneys, and other state criminal justice stakeholders, the 6AC conducted the first-ever statewide assessment of public defense services in Indiana under that system. 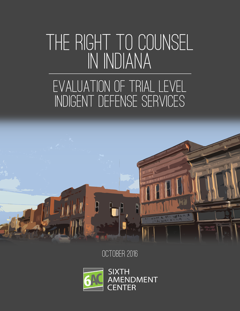 The 6AC’s report, The Right to Counsel in Indiana: An Assessment of Trial Level Indigent Defense Services, released October 24, 2016, is the culmination of a year-long study in which 6AC conducted courtroom observations, interviewed criminal justice stakeholders, and reviewed data in eight representative counties and from the state’s three state-level agencies related to the provision of indigent defense. The National Association of Criminal Defense Lawyers (NACDL) commissioned this report as a part of its public defense reform program, which is supported in part by both Koch Industries and the Foundation for Criminal Justice (FCJ). in those capital cases for which counties do not seek state reimbursement. The 6AC continues to work with the Advisory Group as they join with other Indiana stakeholders and policymakers to build on consensus about current deficiencies in right to counsel services and move forward to protect and fulfill the right to counsel. In September 2017, the Indiana Task Force on Public Defense was created to study the right to counsel in Indiana, validate the 6AC report, and make recommendations for reform. Former Seventh Circuit Court of Appeals Judge John Tinder chairs the 16-member Task Force appointed from all three branches of government and criminal justice stakeholder groups. The Task Force plans to meet monthly through the late spring of 2018 in anticipation of proposing legislative reforms in advance of the 2019 session. 6AC Executive Director David Carroll addresses the Task Force at the November 2017 meeting to explain the 6AC’s findings and recommendations and to provide guidance about how other states’ indigent representation systems. The Maine Commission on Indigent Legal Services (“MCILS”) is an independent commission in the judicial branch that is statutorily charged with providing “efficient, high-quality representation to indigent criminal defendants, juvenile defendants and children and parents in child protective cases, consistent with federal and state constitutional and statutory obligations.” By statute, MCILS is responsible for administering an indigent defense system of “qualified and competent counsel in a manner that is fair and consistent throughout the State” and that is “free from undue political interference and conflicts of interest.” MCILS delivers the majority of services through private attorneys paid hourly ($60/hour) with maximum compensation caps that may be waived with approval of the MCILS Executive Director. In one county (Somerset) private attorneys are paid under contract. However, MCILS is expected to process all vouchers and provide oversight of quality statewide with only two full-time employees. The 2018-2019 Biennium Budget for the State of Maine created The Working Group to Improve the Provision of Indigent Legal Services to “develop recommendations to improve the delivery of indigent legal services to those eligible to receive such services.” The Working Group was required to meet four times and deliver a report in December 2017. After two meetings, the Working Group reached out to the 6AC. Over the course of the next two meetings, the 6AC helped the Working Group understand that it is not possible to have cost certainty unless the indigent defense system has institutionalized oversight. The 6AC was able to get consensus about immediate short-term fixes that could be achieved in the 2018 session. This included expanding the size and authority of the Maine Commission to comport with national standards and expanding commission staff to ensure some beginning level of oversight of services. In December 2017, the Working Group’s final report found, in part, that MCILS does not have “systemic oversight and evaluation of attorneys” and is in need of stronger fiscal management. Among its other recommendations, the Working Group advocated for “an outside, independent, nonpartisan study of Maine’s current system of providing indigent legal services” to determine if alternative methods of delivery would “increase quality and efficiency.” The 6AC is currently conducting the study, focusing on five sample counties: Androscoggin, Aroostook, Cumberland, Somerset, and York. Before 2013, Michigan was one of only seven states in the country that required their counties to carry the full financial burden of providing trial level representation (other than in capital cases). Today it has an independent statewide commission with authority to enforce mandatory standards for the provision of indigent defense in every county and with state funding to assist in doing so. The 6AC provided more technical assistance to a subsequent legislative advisory committee, discussing what has succeeded and what has failed in other states, as the committee worked to develop consensus legislation to solve the state’s deficiencies in providing the right to counsel. In 2013, Michigan enacted a comprehensive legislative package transforming the way right to counsel services are provided. The newly created Michigan Indigent Defense Commission (MIDC) has the power to develop and oversee the “implementation, enforcement, and modification of minimum standards, rules, and procedures to ensure that indigent criminal defense services providing effective assistance of counsel are consistently delivered to all indigent adults in this state.” MIDC has authority to assure that all courts throughout the state comply with statewide standards, and it is authorized to take over the provision of indigent criminal defense services in any jurisdiction that fails to do so, while the lion’s share of the funding to meet the MIDC standards comes from the state and not from the counties. For a more detailed analysis of the reform package, click here. In anticipation of drafting Wayne County (Detroit)’s plan to meet MIDC standards, the county retained the services of the 6AC, in partnership with the Seattle University School of Law, to conduct an evaluation of the State Defender Office – a non-profit public defender agency required under Michigan Supreme Court administrative rule to provide services in 25% of felony cases in the county. 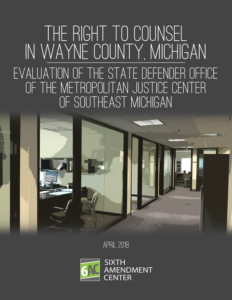 The 6AC’s report, The Right to Counsel in Wayne County, Michigan: Evaluation of the State Defender Office of the Metropolitan Justice Center of Southeast Michigan, prepared in cooperation with the Defender Initiative at Seattle University School of Law, was released April 26, 2018. For 16 years, the State Defender Office in Wayne County received the same funding despite increasing caseloads and overhead expenses. Inadequate funding has led to high turnover among the SDO’s attorneys, and some attorney positions have been left vacant for extended periods. The SDO has not had any social workers, investigators, paralegals, or interns on staff to aid the attorneys in conducting their work. The limited number of SDO attorneys, combined with the large number of courtrooms they are contractually obligated to cover each day, means that the same attorney rarely ever represents an indigent defendant from appointment through disposition of the case. The report demonstrates that people of insubstantial means charged with felony crimes in Wayne County are not afforded effective assistance of counsel, as is their constitutional right, when State Defender Office attorneys are appointed to represent them. The State of Michigan and Wayne County share fault for this failure. The report recommends that the state and county therefore share in the responsibility for providing effective representation in the future. In response to the report’s findings and reform efforts organized by the Michigan Indigent Defense Commission, Wayne County has secured two grants awarding state funds to bolster indigent legal services. The county is using a portion of a $901,371 MIDC grant to retain former State Appellate Defender Dawn Van Hoek as a consultant to determine how all indigent defense services in the county can most effectively and efficiently be delivered. A second MIDC grant of $17.2 million must be approved by the legislature through the state’s appropriations process. If appropriated in the fall of 2018, the funding will go toward addressing the findings of the 6AC report regarding the State Defender Office and improving all indigent defense representation throughout the county. The 6AC has been requested to assess Wayne County’s assigned counsel system that presently handles the other 75% of indigent felony cases. That study is expected to begin in June 2018. The state of Mississippi delegates the entire burden of funding and administering the right to counsel to its counties and municipalities. Prior to 2011, the state did not have any governmental body that collected information about how local governments were carrying out this constitutional obligation. That year, Mississippi established the Office of the Public Defender (OPD). Among the OPD’s duties are to “coordinate the collection and dissemination of statistical data” to guide the state in future planning about the right to counsel, but Mississippi did not provide staff or resources to accomplish this important task. In 2012, the 6AC began assisting the OPD in carrying out its statutory duty to collect and disseminate information about the existing state of indigent defense in Mississippi. Work was conducted under a grant of the American Bar Association. 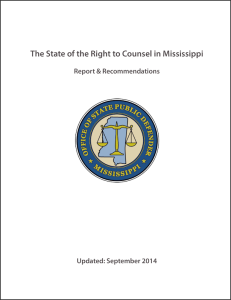 Early results were released in a September 2014 report, The State of the Right to Counsel in Mississippi: Report and Recommendations. In 2015, the Mississippi Public Defender Task Force requested the 6AC to conduct a statewide evaluation of adult felony trial level indigent defense services in Mississippi, in partnership with the Defender Initiative of the Seattle University School of Law. The Task Force selected ten counties for the 6AC to study closely, as a representative sample of Mississippi’s diversity in population size, geographic location, rural and suburban and urban center, and types of indigent defense representation delivery systems used. Those counties were Adams, Clarke, DeSoto, Forrest, George, Harrison, Hinds, Leflore, Lowndes, and Pearl River. Funding for the evaluation was provided by the U.S. Department of Justice, Bureau of Justice Assistance, so that no additional burden was placed on Mississippi taxpayers to gather this critical information. 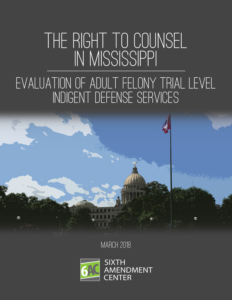 The 6AC’s report, The Right to Counsel in Mississippi: An Assessment of Adult Felony Trial Level Indigent Defense Services, was released March 15, 2018. It demonstrates that the vast majority of indigent persons accused of felony crimes in Mississippi never have an attorney working on their behalf prior to their arraignment in circuit court. Instead, during the entire period between a felony arrest and the arraignment on indictment, indigent felony defendants fall into a “black hole” in which they are not represented by an attorney. At the time of the report’s release, the Mississippi Public Defender Task Force was already working to determine the most appropriate way to promulgate, monitor, and enforce right to counsel standards uniformly throughout the state. The 6AC, with funding from the Department of Justice, Bureau of Justice Assistance, continues to provide guidance and assistance to Mississippi policymakers in their efforts to implement the recommendations of the report. In 2007, the Nevada Supreme Court established an Indigent Defense Commission (“Commission”) to examine and make recommendations regarding the delivery of constitutionally required indigent defense services in Nevada. The following year, the Commission’s Rural Subcommittee went on record that “rural counties are in crisis in terms of indigent defense.” Since 2008, numerous Nevada Supreme Court administrative orders have advanced the right to counsel in the state’s urban centers, but fixing the crisis in rural Nevada has proven to be more difficult. In August 2012, Chair of the Commission and then-Chief Justice of the Nevada Supreme Court Michael Cherry asked the Sixth Amendment Center to prepare a report offering a consensus approach toward improving the provision of the constitutional right to counsel throughout the state and in the rural counties specifically. The report, Reclaiming Justice, was published in March 2013, and it contributed to the Nevada Supreme Court issuing an order declaring that any interference with a public defender’s constitutionally protected independence might henceforth be considered an actual or constructive denial of assistance of counsel that is legally presumed to result in prejudice (see more here). The 6AC work was also instrumental in a July 2015 court order banning the use of flat fee contracts (see more here). On June 8, 2017, the Nevada Right to Counsel Commission (NRTCC) was established by legislative action to conduct a study of issues relating to the provision of indigent defense services. The NRTCC is required to make recommendations to the legislature to ensure that effective assistance of counsel is provided as required by the United States Constitution and the Nevada Constitution. The NRTCC engaged the Sixth Amendment Center to evaluate right to counsel services in the state’s 14 rural counties and one independent city. 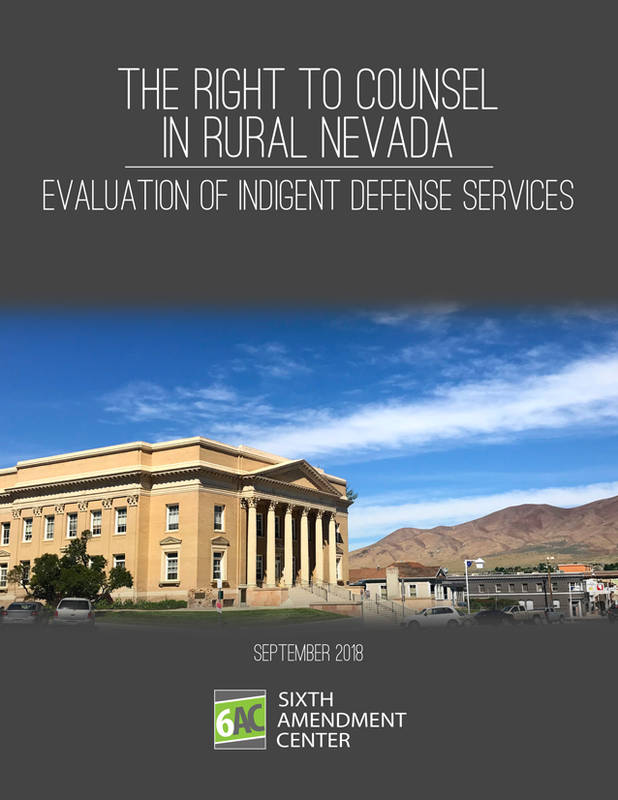 The 6AC’s report, The Right to Counsel in Rural Nevada: Evaluation of Indigent Defense Services, was provided to Nevada policymakers in August 2018 and publicly released on September 18, 2018. It explains for the first time how indigent defense services are provided in every trial level court outside of Clark County (Las Vegas) and Washoe County (Reno). There are longstanding, deep-rooted problems in the rural courts, including: a dearth of public defense data, especially regarding caseloads; a prevalence of fixed fee contracts; a pervasive lack of independence of the defense function from undue political and judicial interference; and the failure to appoint attorneys early enough in the criminal process. The municipal courts in Nevada are a cause of particular concern where some judges chill the right to counsel by informing defendants that they will be charged for the cost of their representation. The Nevada Right to Counsel Commission intends to seek legislative action during the 2019 legislature to begin curing identified deficiencies in Nevada’s provision of the Sixth Amendment right to counsel for the poor. On October 27, 2017, 6AC’s Executive Director David Carroll spoke about supervision and quality control in public defense systems at the Oregon Public Defense Management Seminar, an event sponsored annually by the Oregon Public Defense Services Commission and the Oregon Criminal Defense Lawyers’ Association. Later that day, he met with the Public Defense Services Commission members to discuss the current state of the Sixth Amendment right to counsel across America. In part as a result of issues raised during those meetings, in March 2018, the Public Defense Services Commission asked the 6AC to evaluate the provision of the Sixth Amendment right to counsel to adults at the trial level in Oregon’s courts where that representation is provided through the Oregon Office of Public Defense Services. 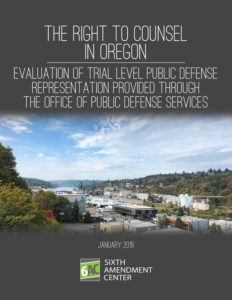 The 6AC’s report, The Right to Counsel in Oregon: Evaluation of Trial Level Public Defense Representation Provided Through the Office of Public Defense Services, was released publicly on January 23, 2019. It explains how providing the Sixth Amendment right to effective assistance of counsel is a state obligation under the Fourteenth Amendment. The State of Oregon attempts to fulfill its obligation to provide effective right to counsel services in trial courts primarily through an array of contracts let by the Public Defense Services Commission (PDSC), and administered by the Office of Public Defense Services (OPDS), with public defender offices, private law firms, consortia of individual attorneys and law firms, non-profit organizations, and occasionally individual lawyers. In doing so, the state has created a complex bureaucracy that collects a significant amount of indigent defense data, yet does not provide sufficient oversight or financial accountability. In some instances, the complex bureaucracy is itself a hindrance to effective assistance of counsel. Moreover, the report concludes that this complex bureaucracy obscures an attorney compensation plan that is at root a fixed fee contract system that pits appointed lawyers’ financial self-interest against the due process rights of their clients, and is prohibited by national public defense standards. The 6AC is engaged on many fronts in helping Tennessee policymakers and criminal justice stakeholders improve the delivery of right to counsel services within the state. On December 18, 2012, the United States Department of Justice (DOJ) announced a sweeping agreement with Shelby County, Tennessee (Memphis), as reported in the New York Times the same day, to cure extensive deficiencies in the provision of counsel to children in juvenile delinquency cases. The agreement requires that much of the American Bar Association’s Ten Principles of a Public Defense Delivery System be implemented in Shelby County’s juvenile courts. From 2014 through 2017,the 6AC served as an advisor to Shelby County on how best to establish independence of the defense function. Meanwhile, the Tennessee legislature is attempting to gather objective data about the number and types of cases being handled by public defense attorneys statewide. Toward that end, the legislature dedicated funding to conduct a statewide “case-weighting study” – these studies identify the number and types of cases the public defense system provides counsel for and also determine the average amount of time needed to handle each type of case effectively. The state’s Administrative Office of the Courts (AOC) recognized that, without a uniform definition of a “case,” any new case-weighting study could not be successful. In July 2013, the AOC asked the U.S. Department of Justice (DOJ) for technical assistance. The DOJ, in turn, funded the 6AC to serve as technical advisor to the Tennessee AOC. Throughout the summer and fall of 2013, the 6AC led a series of AOC-convened meetings of criminal justice stakeholders, including district attorneys, court clerks, and public defenders, to form consensus on a uniform definition and worked throughout 2014 to get broader statewide consensus. In 2014, based on the 6AC work, the Tennessee Supreme Court amended its court rules to define case-counting procedures, clearing the path for Tennessee to fund the adjudicative components of its criminal justice system, including indigent defense, based on objective data. In 2015, the Tennessee Supreme Court established a task force to review the state’s current indigent representation system, including indigency determinations, the delivery of services, and the administration of the indigent representation fund. Their charge is to guarantee that the system is addressing the needs of its recipients as well as benefiting the taxpayers of Tennessee. The Indigent Representation Task Force (IRTF) includes judges, legislators, private attorneys, a legal aid society representative, representative from the comptroller’s office and the governor’s office, and a law professor. The IRTF retained the 6AC, through a grant of the U.S. Department of Justice, to provide technical assistance throughout the process. On April 10, 2017, the Task Force released its report, Liberty & Justice For All: Providing Right to Counsel Services in Tennessee, detailing a plan to revamp public counsel services. Recognizing that Tennessee has seen a “dramatic increase in the ratio of cases to the justice system’s capacity during the past twenty years,” the Task Force concludes that the current system for providing lawyers to the poor “is not sustainable without additional resources.” The Task Force recommended that “Tennessee (1) promote statewide uniformity in the programs providing legal assistance, (2) improve the quality of legal assistance being provided and (3) enhance the management and oversight of these programs,” by, among other actions: a) passing legislation to create a single statewide commission with authority to promulgate and enforce uniform standards over all indigent criminal, delinquency, and civil cases; b) creating a statewide appellate defender office; c) requiring the district defender system to provide primary representation in delinquency cases; d) increasing the numbers and types of support staff in the district defender offices; and e) significantly raising the compensation rates paid to private attorneys to handle indigent cases and setting expert compensation at market rates. On October 3, 2017, the Tennessee Supreme Court released a press statement announcing its unanimous support for the comprehensive indigent defense reforms recommended, including the creation of a statewide indigent defense commission and a state appellate defender office. Significantly, the Court also announced its intention to raise assigned counsel compensation rates. Under the court’s current rule, in all but capital cases, a private attorney cannot be paid more than $40 per hour for case preparation outside of court and $50 per hour for their time in court. Tennessee currently ranks 49th of the 50 states in this regard. Additionally, no matter how many hours a case actually requires an attorney to work, the current court rules establish a maximum amount the attorney can be paid for each case. The court’s press statement signaled its desire to increase pay to private attorneys to $65 per hour for both in- and out-of-court work and to increase the maximum payment for felony cases to $2,000 (up from $1,500 per case) and for juvenile matters to $1,250 (up from $1,000). The 6AC is currently providing technical assistance to the court and legislature to educate policymakers on how best to achieve the other reforms. In 2009, the Utah Judicial Council – the state courts’ highest policymaking body – created the Study Committee on the Representation of Indigent Criminal Defendants (“Committee”) to examine the status of the provision of counsel to the indigent in appeals. The Committee determined that many of the issues affecting the quality of appellate representation were rooted in deficiencies at the trial level. As a result, in 2011 the Committee was charged with studying trial level indigent defense services. After a lengthy vetting process, the Committee asked the 6AC to help. The Department of Justice, Bureau of Justice Assistance provided funding for 6AC to address a January 22, 2013 joint hearing of the Utah Senate and House of Representatives to begin the process of educating them about their constitutional obligations under the Sixth Amendment and to serve as an ongoing consultant to the Committee. On behalf of the Committee, 6AC, in partnership with the Defender Initiative of the Seattle University School of Law and through a grant of the DOJ-BJA, conducted a statewide evaluation of the provision of constitutionally required right to counsel services at the trial level. 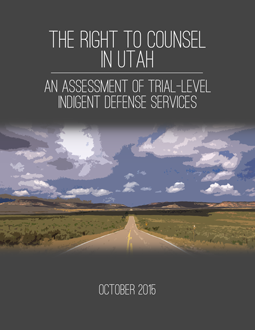 Released in October 2015, the Sixth Amendment Center’s report, The Right to Counsel in Utah: An Assessment of Trial-Level Indigent Defense Services shows that Utah’s trial courts do not uniformly provide counsel at all critical stages of criminal cases as required by the U.S. Supreme Court, with many defendants – particularly those facing misdemeanor charges in justice courts – never speaking to an attorney. As the evaluation that led to this report was ongoing, the 6AC regularly updated the Committee on the complex issues we identified as the crux of many of Utah’s problems in effectively providing the right to counsel. This allowed the diverse stakeholder group to debate the underlying problems and begin thinking of solutions all throughout the evaluation process. Upon receipt of 6AC’s draft report, the Committee requested that they be allowed to work over the summer of 2015 to develop Utah specific answers to the problems. Because of the consensus approach that Utah took and the seriousness and respect with which the Committee did their work, the report and proposed solutions adopted by the Judicial Council Committee were released in tandem with 6AC’s report. In March 2016,the Utah Governor signed into law a bill creating a statewide indigent defense commission after a near-unanimous vote in both chambers of the legislature (Senate: 26-0-3; House: 74-1-0). The principal duties of the Utah Indigent Defense Commission (UIDC) are to adopt guiding principles for the oversight and assessment of public criminal defense services to ensure that: a) indigent defense services providers have independent judgment without fear of retaliation; b) service providers provide conflict-free representation, including a separate contract for conflict counsel; c) the state does not interfere with the service provider’s access to clients and the service provider is free to defend the client based on the service provider’s own independent judgment; d) accused persons are provided counsel at all critical stages of the criminal process; and e) counsel is free to provide meaningful, adversarial testing of the evidence, including adequate access to defense resources and workloads that allow for time to meet with clients, investigate cases, and file appropriate motions. The UIDC is also responsible for granting the first-ever state funding to local governments to meet standards. In 2017, the Utah legislature expanded the authority of the UIDC to include oversight of juvenile delinquency and dependency representation. The UIDC membership was expanded to include expertise in these two law practice areas. In August 2013, the 6AC formed a partnership with the Defender Initiative of the Fred T. Korematsu Center for Law and Equality at Seattle University School of Law (SUSL). Our first joint project, carried out on behalf of the Wisconsin Association of Criminal Defense Lawyers, was to gather information about the compensation paid to Wisconsin private attorneys who are appointed on an hourly rate basis to represent indigent defendants — those attorneys who are not employees of the Wisconsin State Public Defenders Office and are referred to as assigned counsel. Wisconsin has the lowest compensation rate of all 50 states ($40/hour), a rate that has only climbed by $5 over the past 35 years. The 6AC/SUSL team reviewed case law to identify instances of ineffective assistance of counsel provided by assigned counsel and surveyed attorneys about how the low rates affect their ability to effectively represent clients. 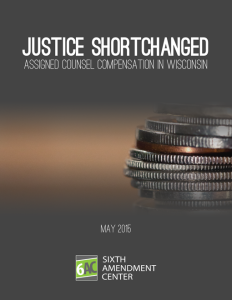 The report of our findings and recommendation, Justice Shortchanged: Assigned Counsel Compensation in Wisconsin, was released in May 2015. In May 2017, a coalition of legal experts petitioned the Wisconsin Supreme Court to end financial conflicts of interest between private attorneys and the indigent clients they are appointed to represent, relying in large part on the 6AC’s report. They asked the state’s high court to ban flat fee contracts and increase hourly rates for assigned counsel from the current $40 per hour that is the lowest in the nation. The coalition included two former Supreme Court of Wisconsin justices, the entire leadership of the State Bar of Wisconsin, noted law professors, and numerous high profile leaders of the legal community from all ends of the political spectrum. 6AC Executive Director David Carroll spoke at the press conference announcing the petition. The Wisconsin Supreme Court held a public hearing regarding the petition on May 16, 2018, and on June 27, 2018, the court partially granted the petition. While the compensation paid by the state to private attorneys assigned by the Wisconsin State Public Defender remains at $40/hour or an even lower fixed contract amount, effective January 1, 2020, counties will pay $100/hour to assigned counsel appointed by the courts.